You wouldn’t happen to know what really happened would you? My memory never cheats. My memory only wins. Every time. This week we’re talking The Memory Cheats, written by Simon Guerrier and released in September of 2011. The Memory Cheats can be purchased for $8 (or your local equivalent) on Big Finish's website. 9:52 Bactrian camels are the ones in central Asia. They’re called that because they’re more becteria and disease ridden than Dromedary camels. 17:09 Rare example of a Voord in its natural habitat, circa 1964. 23:34 The Usual Suspects is a comedy musical starring Kevin Spacey as infamous nanny Keyser Soze. 24:06 The Pied Piper of Hamelin was called that because they threw pies in his face when they eventually found him. 30:21 St. Elsewhere is the patron saint of Doctor Who. 30:46 Check out The Memory Cheats. They’re also on Twitter. Not all trees bleed, but the ones that do… they’re pretty creepy. I’m pretty certain this is the newest audio drama that we’ve listened to, which is kind of interesting because it’s also about the oldest (and one of the best) TARDIS team on the books. Unless, I guess, if you count just The First Doctor and Susan. Which maybe you should, I don’t know. It’s Domain of the Voord, written by Andrew Smith and released September 2014. Domain of the Voord can be purchased for $11 (or your local equivalent) on Big Finish's website. 6:14 Water World is a movie about the entire planet getting covered by water. It takes place in July 2017 so we only have a couple weeks left. 11:48 Fish Fight is a new movie about some teachers engaging in Star Wars prequel style duels but instead of lightsabers they use frozen fish. 16:01 HE MUST NOT BE FORGOTTEN. Also the Monk was an advisor to him according to some book. What the hell. 29:34 He must really not be forgotten. 35:36 That audio is Beached if you want to listen to it. 36:47 Slipknot are a Norwegian folk band. 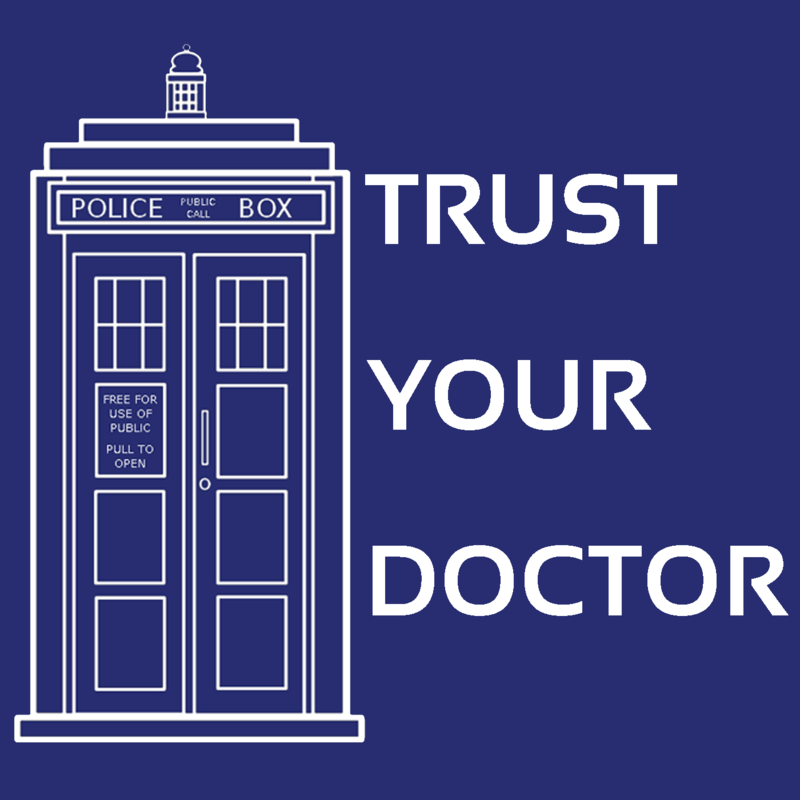 This week Trust Your Doctor makes it to the halfway point of the audio drama side-step they did. Which means next week we listen to another first doctor story and then work our way back up again. But this week, it’s The Anachronauts, written by Simon Guerrier and released in January of 2012. The Anachronauts can be purchased for $8 (or your local equivalent) on Big Finish's website. This week we decided to walk across a nice little moor in Scotland. We watched as someone just out of view got struck by lightning. It was really weird, there weren’t even clouds in the sky. We ran over and told us a story, the story of Helicon Prime, relayed to him by Jake Elliott. Apparently the story was first told in November of 2007. Helicon Prime can be purchased for $8 (or your local equivalent) on Big Finish's website. Everybody knows that the hyper ancient >>>> regular ancient. This week we’ve reached the companion chronicles section of the podcast. Which means we’re at the non full cast audio section of the 16 week adventure. Which also means our episodes might be slightly shorter for a few weeks. Never fear, we’ll return to full 2 and a half hour length glory soon. It’s Ghost in the Machine, written by Jonathon Morris and released October 11, 2013. Ghost in the Machine can be purchased for $8 (or your local equivalent) on Big Finish’s website. 10:03 10 seconds on Youtube told me that this recording is actually the very first. 27:02 It’s actually from a critique of Descartes by some dude name Gilbert Ryle. I heard it really ryled Descartes up. Ha. This week Mark Gatiss returns to the podcast. Sort of. I mean, he’s not a guest or anything, he’s just written another story that we’re reviewing, which mean’s he’s the first writer to cross mediums for us. It’s Phantasmagoria, written by Mark Gatiss and released in October 1999. Phantasmagoria can be purchased for $3 (or your local equivalent) on Big Finish's website. This week it seems we’ve jumped a time-track. We’ll get it back on track shortly, I just need to recalibrate my time scanner… thing. Look, I’ve read the TARDIS manual and I still have absolutely no idea what this part is so I guess I’m just going to throw it out. It’s The Nightmare Fair, written by Graham Williams, adapted by John Ainsworth, and released in November of 2009. The Nightmare Fair can be purchased for $13 (or your local equivalent) on Big Finish's website. Show-notes: 0:41 Jamie Robertson’s Doctor Who theme for the Mary Shelly stories. This week we’re joined by Brendan and Nathan for what is quite possibly the most inefficient (but surely the most interesting) summary of a Doctor Who story in existence. The four hosts proceed to spend about 2 hours explaining the 2 hour long story. It might just be quicker to read the wikipedia page for the story while listening to it. But that wouldn’t be as fun, now would it? We also spend upwards of 10 minutes just trying to end the episode. It’s Bang -Bang-a-Boom! written by Gareth Edwards and Clayton Hickman and released in December of 2002. Bang-Bang-a-Boom! can be purchased for $3 (or your local equivalent) on Big Finish's website. Show-notes: 10:56 The Mostly Made-up Doctor Who Episode Guide is still one of the best Doctor Who podcasts out there. Why don’t you, uh, go and, uh, take a listen to them? Uh? Right there. Go on. Do it. Hey look, kaboom and vroom rhyme. This week we start a new era, and then immediately end it. It’s a single episode long, albeit a much longer than usual episode. It’s a bit weird, you may not have heard of it. It’s called The TV Movie, written by Matthew Jacobs and aired in May of 1996. 22:55 He should have worn it cause he’s not a crook. 39:53 They mentioned it again in Invasion of Time. 48:06 I don’t know if it’s a reference but the guy was Kevin Briggs. We did it. We’ve reached the end of the classic Doctor Who. The show is dead. We’re dead. Everything is dead. Which is kind of weird, because the story is called Survival. It was written by Rona Munro and aired in November and December of 1989. 6:30 Wow, it’s real. But apparently black cat appreciation day also exists and is on August 17th. I have my calendar marked. Actually I don’t. 11:51 Probably Doctor Who and the Silurians. 21:25 According to this National Geographic article from 3 years ago, Cheetah’s are between 40 and 50 percent successful, less than other big cats. 50:22 Mostly Made Up Doctor Who Episode Guide is now my favorite Doctor Who podcast. Halfway through the final season wow. This week we’re back with possibly the most confusing story ever broadcast in the history of television. I promise. It’s Ghost Light, written by Marc Platt, aired October of 1989. 5:07 Yeah, apparently they used a real house just for the exterior and apparently the observatory was added in post production. 13:37 Well searching “round mini shades” only brought up pictures of lampshades and searching “round mini glasses” brought up pictures of drinking glasses. My google fu is weak. Oh well. 17:35 There were a bunch of guys who researched these moths, but one of the first was someone named JW Tutt. Here’s a random journal article about him. The J didn’t stand for Josiah by the way. 21:19 Meh. Too lazy to read all of this. So maybe. You tell me. 24:04 It’s actually a big slug thing from Star Wars. Oh, sorry that’s Jabba. Java is an island in Indonesia. 37:21 According to a text from Dylan, she had nine heirs. See here for more details. This week’s episode is brought to you by death. It’s the final season. (To the tune of final countdown). Can you believe it? Well we’re almost at our crazy dark years plan and it’s going to be great, I promise. Until then, it’s Battlefield, written by Ben Aaronovitch and aired in September of 1989. 6:41 Apparently the silver bullets killing werewolves idea got its start thanks to this jerk dog that ate some people in France. 22:11 You mean this one? Looks actually terrible, so no thanks. 24:03 They made him up. As opposed to a benevolent psychic eye. The Greatest Show in the Galaxy is not, as you might expect from our comments, Doctor Who. The Greatest Show in the Galaxy is actually Trust Your Doctor. What a twist! The Greatest Show in the Galaxy was written by Stephen Wyatt and aired in December of 1988 and January of 1989. 11:25 He was a British guy who traveled to Hawaii, New Zealand, and a bunch of other places. Just like that John Travolta movie. This week we move into season 25. Can you believe we’ve almost finished 25 years of Doctor Who? Time wise that’s almost half of all the time it’s existed. It’s Remembrance of the Daleks, written by Ben Aaronvitch and aired in October of 1988. 7:09 Quite possibly the most simple money system the world has ever known. Just look at this simple and easy to use chart. 23:23 Surprisingly long Wikipedia article about this. And the inevitable disappointment that comes after it. And we close out the first season of Sylvester McCoy. It’s the real McCoy. Two seasons left, and spoiler, The Seventh Doctor has a snap character change next week. It’s Dragonfire, written by Ian Briggs, aired in November and December of 1987. 1:04 Hopefully our other podcast, Triple Play, isn’t alien to you. But if it is, check it out. 24:21 Svalbard is part of Norway and has some of the northernmost settlements in the world. This is what it looks like in summer. 26:13 Pinewood Derby. Pretty good episode. You shouldn’t mess with the power of Malcolm, it might kill you. This week we’re on the downslope for season 24 already. We’re already 3/4 of the way through the serial, although if they had done a 6 part serial we’d be done already. Wouldn’t that be great? It’s Delta and the Bannerman, written by Malcolm Kohll, and aired in November of 1987. 04:36 Now only a $100 value! Sure must be the happiest place on earth for whoever’s raking in all this money. 12:00 OG version’s the best. 30:43 Wow, 2009 camcorder-vision. Still not the stupidest answer on this show sadly. You can find us at our regular places. Be sure to follow to be updated on our “The Trust Your Doctor Full Classic Retrospectivaganza” schedule. It starts on the 23rd of April, by the way, because we record stuff a week in advance. Mine is lightly salted. I like to keep it simple. Moving swiftly through the Seventh Doctor. He only has 12 serials, so every serial we cover moves us 1/12 of the way closer to the end. That’s pretty much the quickest we’d move through any Doctor except maybe the 6th. Too lazy to do the math now. It’s Paradise Towers written by Stephen Wyatt and aired in October of 1987. 44:30 Check out our other podcast, Dribble Day. Actually it’s like a 1/7 in chance that it’d land on Christmas. Although I’m not a statistician so who actually knows right? It’s Vengeance on Varos, written by Pip and Jane Baker and aired in November of 1986.